A: I don’t know. I really love a minimal design. My first version was more like a flat/material design. The second one was „normal standard“, Bootstrap, parallax effects, like every other website. The third was more minimalistic but not really that what I wanted. I also quit my old job and got a new one, so I decided that I could update my site completely with a new design. So started a to code the site, no screendesigns or wireframes. At the end of the day I finished the site. I’m pretty sure that I gonna update my site with some pictures or maybe some colors by time. But that’s the point for me, brutalist websites are beautiful and have a message. You can have a site with text written in rainbow-colored Comic Sans with random pictures behind the text or you just work with one color, one font and nothing else. 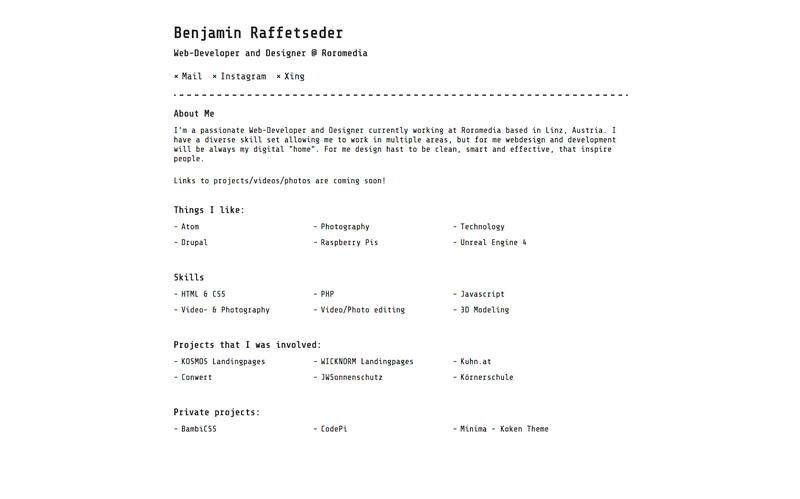 Okay, now the answer why I have a Brutalist Website: I like the concept and the style. Experimental stuff is most of the time a good thing. A: I always switching between Atom and VS Code. But after a few days I fell in love with Visual Studio Code! It’s a really nice code editor.